A 2013 Ivey Award winner for Overall Excellence returns this summer! Open Eye Figure Theatre's delightfully silly Milly and Tillie is playing at their charmingly intimate space in South Minneapolis through June 25, and then moves to Artistry in Bloomington July 8 through August 13. Like the silliest public television show for kids brought to full and vivid life, sisters Milly and Tillie Silly will delight their guests, the audience, for just under an hour, at which point you will be sad to say good-bye to them. The website says "recommended especially for grade school children and toddlers as well as parents and grandparents!!" I am none of the above, and I still enjoyed watching the Silly sisters, and only slightly less, I enjoyed watching the tiny humans who were completely enraptured by them. Performed by Liz Schachterle (Milly with a Y) and Elise Langer (Tillie with an IE) and written by them along with Jason Ballweber (who also directs) and Rachael Davies, Milly and Tillie is a perfect creation for kids that doesn't overstay its welcome. We spend a typical day with Milly and Tilllie as they go on a picnic (a-pic-a-nic! ), which is rained out, so they play underwater a while, then return home. And that's about it, but it's all done in such a broad, silly, and specific style that it would be fun to watch anything they do, however mundane. After several years creating and performing this show, Liz and Elise are both so comfortable with their characters that they're able to be completely open and playful. There was a bit of talking back to the stage from the kids sitting on pillows directly in front of it, and that's totally welcome and part of the experience. 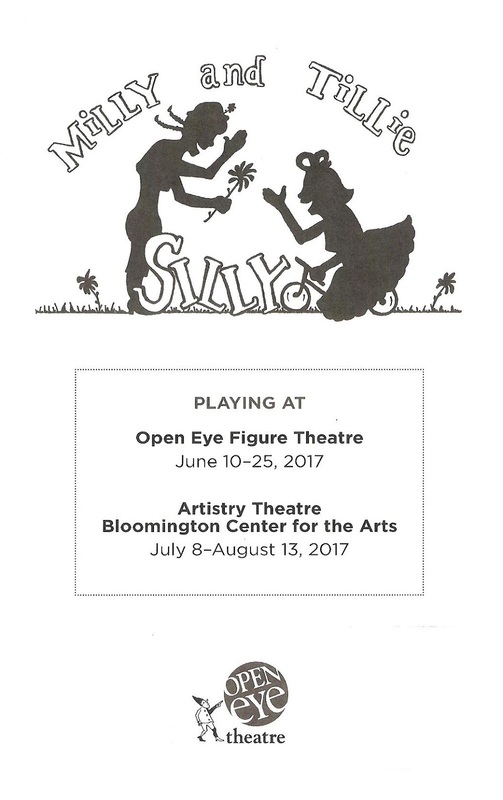 This being Open Eye Figure Theatre, there is a bit of puppetry involved, including the sisters' friends Mr. Bear and Lord Bear, and the creatures they encounter on their underwater picnic (Laura Abend is the behind-the-scenes puppeteer). 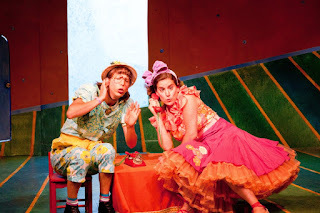 The set is a colorful 2D concoction that plays with perspective, and the sisters are clad in bright and colorful patterns (set and puppet design by Eric Van Wyk, costume design by Maria Bianchi). In a world were bad things continue to happen at a seemingly faster and faster rate, it's refreshing for kids, and adults, to have a space to be silly and carefree for a bit. Milly and Tillie is a sweet, innocent, terrifamapic little show. Take your little ones, or go yourself if you need a welcome dose of the silly.